Bus from Shah Alam to Kuantan is the most common mode of transport for locals to travel between two cities. 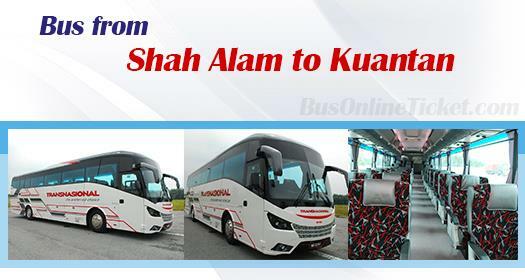 Many local passengers rely on the direct bus from Shah Alam to Kuantan to save their hassle from travelling down to Kuala Lumpur Terminal Bersepadu Selatan (TBS) for taking bus. Transnasional is the most reliable and famous bus company offering bus from Shah Alam to Kuantan. They provide 4 daily departures from Shah Alam to Kuantan. The first bus service starts from morning 10am and the last bus leave the Shah Alam Bus Terminal at night 11:00pm. Many passengers choose to take Transnasional because of their consistent service and punctuality throughout these years. Transnasional Coach fleet deployed in this service route is single VIP coach. The air conditioning VIP coach is equipped with seat arrangement of 1 on the left and 2 on the right. The spacious seat layout ensures passengers having comfortable journey from Shah Alam to Kuantan. The departure point in Shah Alam is at Shah Alam Bus Terminal locared at Seksyen 13. Passengers can get to Terminal Bus Shah Alam Seksyen 13 by intercity bus or taxi. The arrival point in Kuantan is at Terminal Sentral Kuantan. The bus fare from Shah Alam to Kuantan is around RM 28.10 per ticket for adult and RM21.10 per ticket for child. Duration required from Shah Alam to Kuantan takes about 3 hours. At least 1 stopover will be provided during the journey for passengers to ease themselves and stretching. BusOnlineTicket.com offers the most reliable and hassle-free online booking experience to their users. BusOnlineTicket.com is an online bus ticketing portal that allows you to purchase bus ticket online in anytime and anywhere. You can make your payment securely via online payment gateway.